Learn how to perform magic tricks and illusions using simple science experiments in this children's activity book for kids aged 7-9. Join science presenter Steve Mould, #1 bestselling author of How to be a Scientist, to find out the secrets behind amazing magic tricks. Learn how to bend water with a balloon, make a glass beaker disappear in oil, and wow your friends with levitating tinsel! Each magic trick is explained using step-by-step photography, with the science behind each one described clearly and simply. Plus, interspersed throughout the book you'll find out how legendary magicians and illusionists, such as Harry Houdini, used science when performing their most famous tricks. Kids will love impressing their friends and families with simple magic tricks that teach them valuable science lessons at the same time. 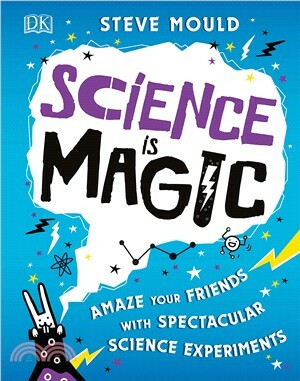 Packed with optical illusions and fun facts - Science is Magic is a must for any wannabe scientist or magician.